In spring this year I bought a number of new varieties (new to me, anyway) from Bryan Brunner in Porto Rico. Most of them have grown vigorously and built up good strong rootstocks, which I am very pleased about, but 'Sherry Baby' has rushed up to flower at only four feet tall. I imagine that it will improve on that a bit next year. A fabulous pinkish orange that seems to have a slightly shadowy dusky tint in real life, that possibly doesn't show so well in the picture. 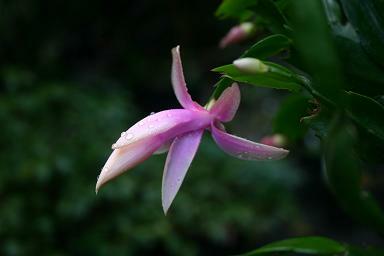 I have a slight fascination with Schlumbergera caused by their obliging autumn flowering and general good cheer. 'Gold Charm' is a relatively modern variety that was raised in the pursuit of a yellow flower. 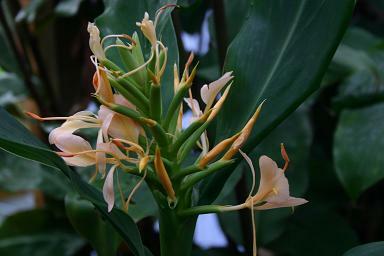 If grown under reasonably warm conditions, it is a pure pale orange (and 'White Christmas' is almost white). 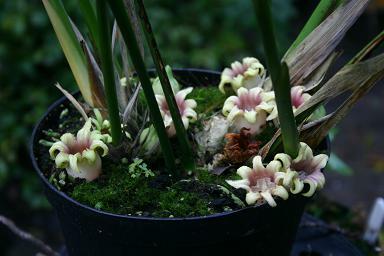 Unfortunately I have to grow them in a cold conservatory, and the flowers develop a strong pink tinge. All very lovely, modern breeding is producing some beautiful flowers, but tending to have weak growth which rather undermines their value. All of the Aspidistra are wonderful. A. attenuata is always autumn flowering, and this year it seems to have excelled itself with its little green bubble flowers.